Deep in the dense tropical forest of Meghalaya, and shrouded in cloud and rain for much of the year, are some astonishing man-made natural wonders. 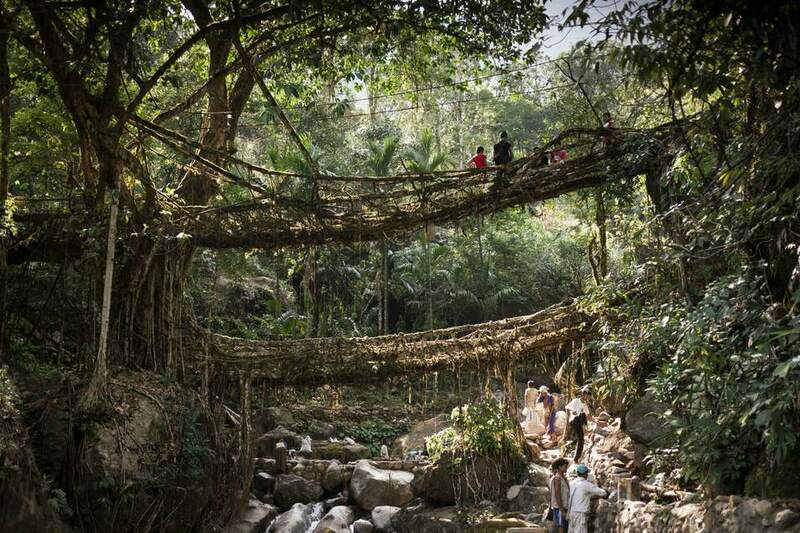 Known as living root bridges, inventive members of the Khasi tribe have trained them to grow from the roots of ancient rubber trees, native to the northeast region. The root bridges provide a stable alternative to wooden bridges, which decay and get destroyed during the lengthy monsoon seasons. It takes around 15 years for a new root bridge to become strong enough to bear the weight of people crossing it. However, it will continue to grow and strengthen even more over time. Some of the bridges are believed to be hundreds of years old, although no one knows their exact age. Their tangled webs of roots are almost eerie in nature and wouldn't look out of place in a fantasy world. Meghalaya's most famous root bridge, the "double-decker" root bridge, can be found in the vicinity of one of the wettest places on earth -- Cherrapunji (also known as Sohra). 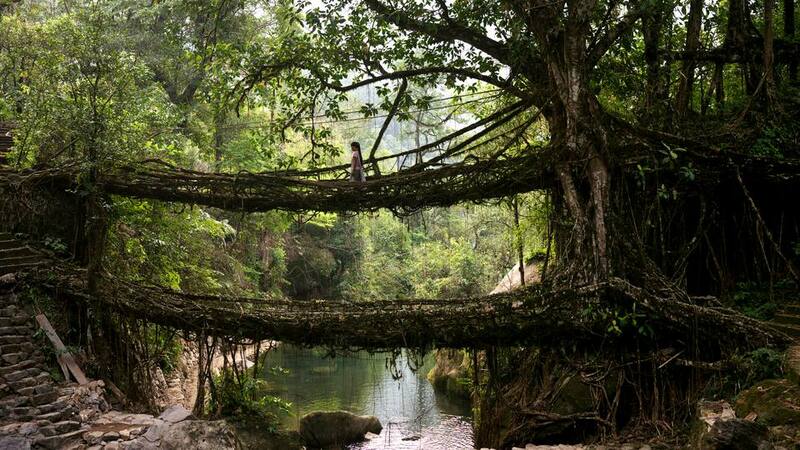 There are 11 functional root bridges in this area, situated about two and a half hours drive from Shillong. The bridges have been documented as far back as 1844, in the Journal of the Asiatic Society of Bengal. However, it's the owner of the Cherrapunjee Holiday Resort (a retired Tamil banker who's married to a local Khasi woman) in Laitkynsew village who put them on the tourist map. He spent a lot of time exploring the surrounds and detailing interesting treks when setting up the resort. (The Cherrapunjee Holiday Resort is a delightful, homely place to spend time in nature and guides are provided for trekking. However, don't expect resort-style facilities). Ummunoi Root Bridge. Starting point: Laitkynsew village. Location: Ummunoi river near Siej village, Nongkroh, via Sohsarat village. Duration: Two kilometers one way. Three to four hours return. Descent: 1,400 feet. This 17 meter (54 foot) root bridge is one of the oldest known root bridges in the region, and is perhaps the most popular with tourists due to its combination of accessibility and impressiveness. Umkar Root Bridge. Starting point and location: Siej village. Duration: Half a kilometer one way. 30 minutes return. The best option for those who are lacking in fitness or mobility, this root bridge was partly washed away by flash floods. The villagers in the process of regrowing it, which is interesting to see. There's a waterfall alongside the bridge during the monsoon season. Ritymmen Root Bridge (can be visited on the way to the Double Decker root bridge). Starting point: Tyrna village. Location: Nongthymmai village. Duration: One and a half to two hours return. This 30 meter (100 foot) root bridge is the longest known living root bridge. Umshiang Double Decker Root Bridge. Starting point: Tyrna village. Location: Umshiang river at Nongriat village. Duration: Three kilometers one way. Four to five hours return. Descent: 2,400 feet. The "holy grail" of root bridges, the unique 20 meter (65 foot) double-decker root bridge requires determination to reach but it's worth it. Not everyone can go there though. It's imperative that physical condition be taken into account. Mawsaw Root Bridge. If you're not too exhausted and have the time, continue to walk around 20-30 minutes past the Double Decker root bridge. The natural swimming pools near this root bridge are a highlight (they're unsafe during the monsoon season though). An alternative to the root bridges around Cherrapunji, there's also a substantial root bridge near Mawlynnong village -- and it's readily accessible. Renowned for being declared the cleanest village in Asia by a travel magazine, scenic Mawlynnong also promotes itself as "God's Own Garden". The village is located near the Bangladesh border, around three hours from Shillong. To reach the root bridge, drive to Riwai village, a few kilometers before Mawlynnong. From there, it's approximately a 15 minute walk one way. The legendary double-decker root bridge at Nongriat village near Cherrapunji, in northeast India's Meghalaya state, beckons outdoor enthusiasts with the opportunity to see a 150+ year old man-made natural wonder that's not only unique but astounding. While there are many single root bridges in the area, this is the only one that has two levels. Apparently, local Khasi tribe members grew the second level after an unprecedented wet monsoon season caused water to reach the first level. A third level is planned, but only to capitalize on the bridge's tourism potential. The beauty and cleanliness of the village is also outstanding. It's obvious that the residents have high regard for the environment. While the root bridge is undoubtedly remarkable, its surroundings feel like a place where magic happens. There are waterfalls and natural swimming pools, clusters of huge brightly colored butterflies, mysterious sounds of the forest, and so much ancient wisdom. Visiting the double-decker root bridge is not easy. The trek there is long and tiring. It's worth it though, for an out-of-this-world experience that's guaranteed to be a highlight of your travels. Read any article about the double-decker root bridge and you'll most likely come across a warning about the arduous nature of the trek. But just how arduous? You might be concerned about whether you're capable of it and how difficult it will be. The reality is that you don't have to be super fit. However, if you have any joint or mobility issues, or are not in decent physical condition -- definitely don't do it (there are other easier options to see the living root bridges). The trek is very steep in parts, and will put a lot of strain on your knees and calf muscles. I don't consider myself to be fit. I'm slim but I exercise irregularly. The trek took me two hours each way. This was walking at a leisurely pace there and a steady pace on the way back. I spent a hour relaxing at the double-decker root bridge. So, all up, I completed the trek in five hours. My muscles hurt a lot for a few days afterwards. The path to the double-decker root bridge is three kilometers (nearly two miles) long. It has approximately 3,500 stairs and descends 2,400 feet. Those are some daunting figures, but don't let it put you off! There are three parts to the trek. The steepest and most challenging part is the first part, down the hill to Nongthymmai village (where the longest root bridge, Ritymmen, is located). It takes about 45 minutes, along a seemingly endless trail of steps that plunges deeper and deeper into the forest. It seems like paradise, with jack fruits and pineapples growing wildly amid the jungle of vegetation. Nongthymmai is a surprisingly attractive village of bee keepers with neat cement paths, well-groomed flower gardens, and blue and white painted church. From there, it takes at least another hour to reach the double-decker root bridge. The remaining two parts of the trek, which involve crossing narrow steel suspension bridges over raging rivers, are much flatter and less taxing. However, this, as well as the steep descent, may make the trek challenging for anyone who's afraid of heights or has vertigo. Just as start doubting whether you'll ever get there, after tackling yet another ascending staircase you'll be greeted with a sign announcing Nongriat village. Drag yourself up the final set of stairs, look down, and there it will be like something from a fairytale-- the double-decker root bridge with it's gnarly thick roots covered in moss. The trek to the double-decker root bridge starts at Tyrna village, around 30 minutes past Cherrapunji (and not far from the Cherrapunji Holiday Resort in Laitkynsew village). It can be comfortably done on a day trip from Shillong. From Shillong, it takes approximately two and a half hours to drive to Tyrna, and costs about 3,000 rupees return. A reliable taxi driver, who's based in Shillong and knows the area, is Mr Mumtiaz. Phone: 9206128935. Cherrapunji is known as one of the the wettest places on earth. The rainy season starts in April and continues until October. Most of the rain is received during June and July. It rains intermittently during the rest of the monsoon months. Rainfall usually occurs during the morning. (When I did the trek in mid May, the morning was wet but the afternoon was sunny). You'll find a useful rainfall chart here. In January (the dry winter season), the average maximum temperature is 16 degrees Celsius/60 degrees Fahrenheit. This drops to around 5 degrees Celsius/41 degrees Fahrenheit at night. In July (the wet monsoon summer season), the average temperature increases to a maximum of 22 degrees Celsius/72 degrees Fahrenheit during the day. At night, it drops to an average of 18 degrees Celsius/65 degrees Fahrenheit. You may be tempted to wear a raincoat or other wet weather/winter clothing. However, it's actually preferable to wear as little as possible. Due to the strenuous nature of the trek, you'll get hot very quickly. Your clothes will become saturated with sweat and it's much more comfortable to let your skin breathe. In regards to footwear, choose comfortable shoes that have good grip. (Sandals are fine, particularly if they're proper walking sandals such as Birkenstocks, which is what I wore). If you're concerned about the rain, it's a good idea to bring an umbrella. Pack some food and water, as you'll only find a couple of shacks selling packaged drinking water and snacks along the way from Tyrna to Nongriat village. You'll be able to get basic Indian vegetarian meals at Nongriat. Wearing a cap and sunscreen is recommended if you have fair skin. Mosquitoes are present in the evening, so you might want to consider mosquito repellent as well. It's possible to go swimming in the natural pools at the double-decker bridge, so bring appropriate swimwear if you want to do this (it's really refreshing and change rooms are provided). Do be aware that everything you take adds to the weight though, and you'll really feel it when hiking back up the hill. There are a few guesthouses and homestays in Nongriat village that provide very basic accommodations. If you have the time and don't mind some discomfort (minimal facilities are provided), it's worth staying a night or two as the surrounding scenery is spectacular. You can trek to waterfalls, natural swimming pools, and other root bridges from the village. Again, pack as light as possible, as you'll struggle with carrying a heavy backpack. Entry and camera fees are payable at the double-decker root bridge. The cost is 10 rupees for adults, 5 rupees for children, and 20 rupees for a camera. The local Khasi people are very conscious of their environment and maintaining its cleanliness. Indian-style (squat) toilets are available at the double-decker bridge, and there's a fine of 500 rupees for anyone caught relieving themselves in the forest or throwing rubbish. Aim to be back at Tyrna by 5 p.m. at the latest, as it starts getting dark early there. It's not necessary to take a guide, although many people do, as the pathway is signposted.